Slim, smooth and contemporary. Our aluminium bi-fold doors offer the highest standards of function and form. Aluminium bi-fold doors are a truly excellent option for customers looking to add a sleek, modern twist to their property. Open up your home today with revolutionary bi-folding doors from Select Products and benefit from an increased sense of space and style, whatever your budget or taste preference. 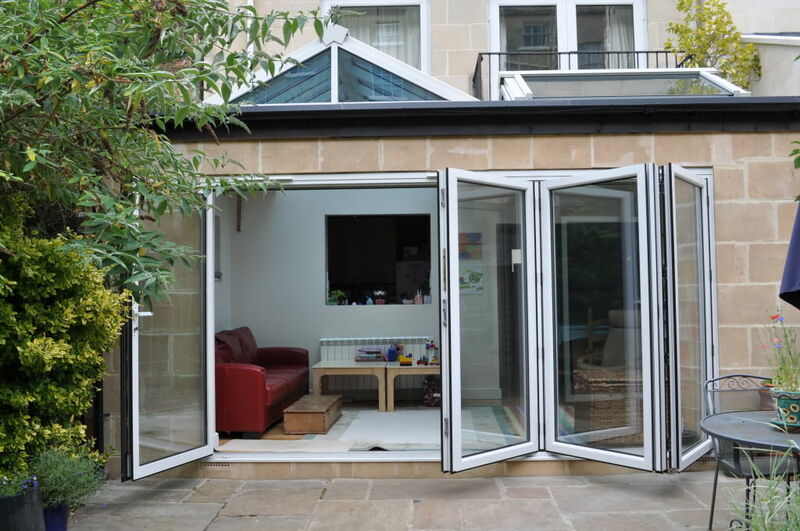 Our innovative aluminium bi-fold doors are supplied and fitted throughout Leeds, Harrogate, Pudsey, Wetherby, Horsforth, Yeadon, Otley, Bradford, Ilkley and surrounding areas. Whatever the character of your home and its neighbouring properties, we have an aluminium bi-fold door to blend in seamlessly. If doors are installed incorrectly by fitters that are unfamiliar with the product it can result in a host of unexpected problems for home owners like you. These can include, but aren’t limited to, leaks, draughts, or even structural damage to your home. This will not have to be a worry for you if you buy your aluminium bi-fold doors with Select Products, and you can rest assured knowing that all of our installation professionals are equipped with years of door fitting experience and expertise. 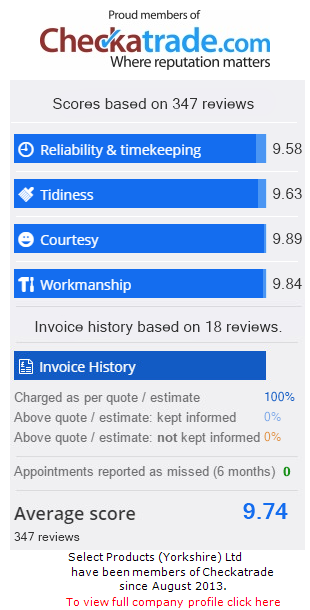 Our exceptional level of skill is backed up by our wealth of satisfied customers, and we are proud to have received numerous glowing reviews on Checkatrade praising our team’s reliability and workmanship. Your home is an extension of you, so make sure that you leave it in the most capable of hands. 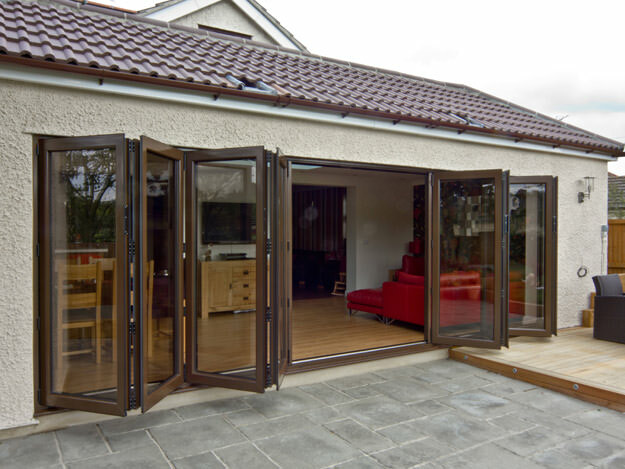 Differing from their uPVC counterparts, aluminium bi-fold doors are able to achieve a thinner surrounding frame. This increases the surface area of the glass, allowing you to enjoy larger sightlines and the greater viewing area that this brings. With our aluminium bi-fold doors you can enjoy viewing your garden to the highest degree. Bi-fold doors also allow a spectacular amount of natural light to flood into your living space. This can therefore make them a fantastic addition for any property owner looking to bring light and scope to a room. Our aluminium bi-fold doors are a perfect option for people who want to make the most of their outdoor space and want to appreciate it even throughout the colder months. A thinner frame creates a contemporary look, bringing elegance to your home. Aluminium is easily malleable and therefore secures a neatly polished, luxury finish. The trim frame also cuts down on bulk, effortlessly combining with the large viewing areas to create an illusion of space. 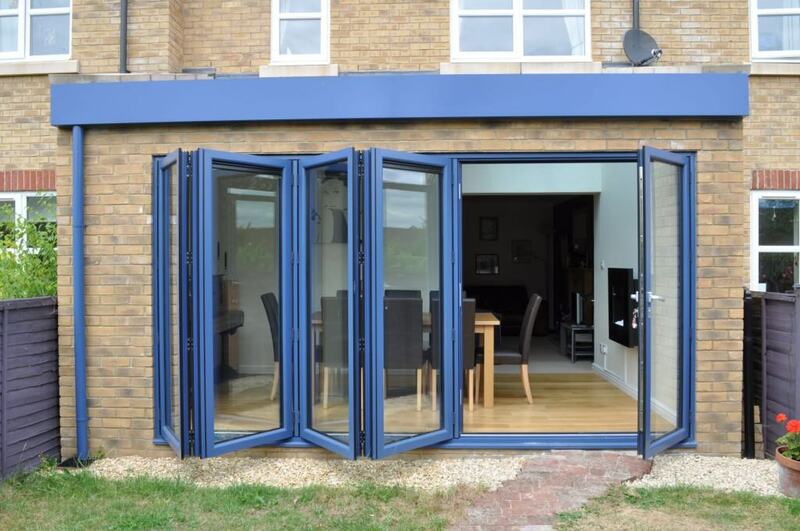 This makes aluminium bi-fold doors perfect for the open plan style seen in many modern houses today. Aluminium bi-fold doors also boast exceptional adaptability, creating a seamless connection between your home and garden. You can easily increase or decrease our door’s panel number in relation to the space they are needed for. This means our bi-fold doors can be easily accommodated into properties of any size and budget. Our folding doors can also be tailored to your tastes and your family’s needs. You are able to choose the fold configuration from left to right or vice versa to allow the doors to fit seamlessly into your existing home and garden layout. The edges of our aluminium bi-fold doors are also able to be made square or round in shape to blend into your home’s existing characteristics. One of the biggest advantages of aluminium bi-fold doors is that you have an endless choice of colour options at your fingertips. Aluminium can be sprayed in thousands of RAL colours; offering you a huge amount of variety in customisation. We also offer a fantastic range of superior hardware finishes, so pairing your hinges and handles with any RAL colour shade you choose has never been easier. There are limitless options to create the perfect aluminium bi-fold doors to complement even the most unique of properties. For aluminium bi-fold doors, being stylish doesn’t come at the cost of security. Smart’s hardware ensures that the shootbolt multi-locking system keeps your property safe from any unauthorised access. You can rest easy knowing that your folding doors will open your home to garden views, and not to would-be intruders. Our locking system is available in the domestically popular ‘lift up’ handle, and a one-piece adjustable keep. The robust panels and hinges used in the construction of our doors create a consistently secure standard across the whole frame, ensuring that your family and property remains defended to the highest possible degree. Aluminium is a surprisingly strong material to use for bi-folding doors, despite being thinner than uPVC. The lightweight nature of aluminium makes it the ideal material to use for a concertina sliding motion, decreasing wear and tear on the rolling system even on the most frequently used doors. Aluminium bi-fold doors will hold steadfast against the elements and they will not unhinge by rotting or warping. This ensures our doors are incredibly long-lived, and we are proud to support this claim with a 10 year manufacturer backed guarantee. Smart’s Thermal Breaker Technology is essential in allowing your aluminium bi-fold doors to control air permeability. Polyamide, a highly effective insulation material, is placed within the inner and outer skins of the bi-folding door to increase its thermal efficiency. This added insulation creates a greater heat retention inside your property, allowing less heat to escape outside. The high performance energy efficiency of our aluminium bi-fold doors can therefore save you money on your energy bills, and reduce your carbon footprint. Find out how much a set of our luxury aluminium bi-fold doors will cost you using our quick and simple online quote builder below. Simply enter your sizes, select your chosen configuration, design your doors (you can even choose a colour from a comprehensive range of RAL colour options) and get an instant online price at the click of a button. You can also arrange a free no obligation quotation by contacting us via our online contact form or using our quoting engine below. 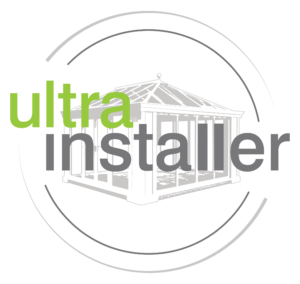 If you would prefer to speak to one of our in-house home improvement specialists directly, you can alternatively call us on 0113 257 8933 for Leeds, or 0142 321 0021 for Harrogate and a helpful member of our team will be happy to guide you through our competitive prices.